Producing high quality Woven and Tufted Carpets for decades, Hugh Mackay Carpets are a British treasure in the flooring trade. 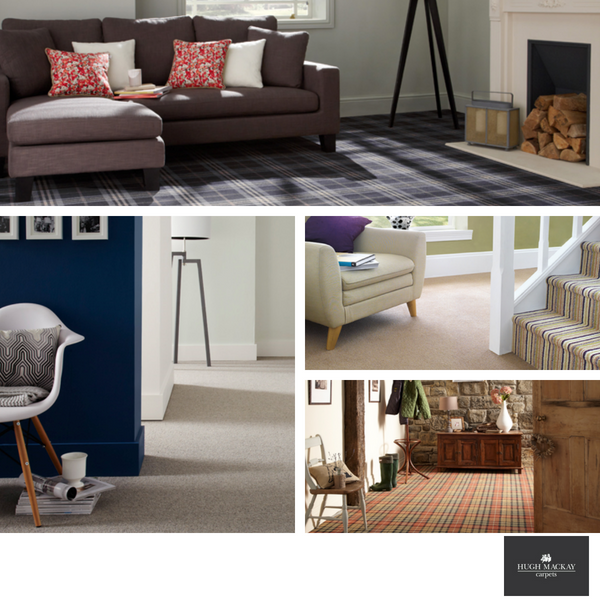 As part of the Whitestone Weavers group, Hugh Mackay offer a wide selection of carpets to suit all interiors so whether it's a traditional Tartan Lounge Carpet or a Striped Stair Carpet needed to finish your home, why not call into our Heaton Moor showroom today to see what's available. Axminster- Hugh Mackay make some of the most beautiful patterned Axminster Carpets on the market today such as the Floral Designs of Natures Own and the traditional Pindot Collection in the Liberty Range. Tufted Carpet- A splendid mix of Tufted Carpets are on offer from Hugh Mackay from the delightful mix of plain 80/20 Wool carpets in the Durham Twist range to the 100% British Wool Zig Zag Deco Collection that's extremely hard wearing making it perfect for a busy hallway or a stair carpet. Hand Made- If you're looking for a luxurious hand loomed carpet that's built to last, then Hugh Mackays collection might be ideal for you. Such best sellers as the 100% Wool Textured Loop Pile Scrumptious and the pleasantly soft 100% Wool Debonair are both available from Bramley Carpets today.